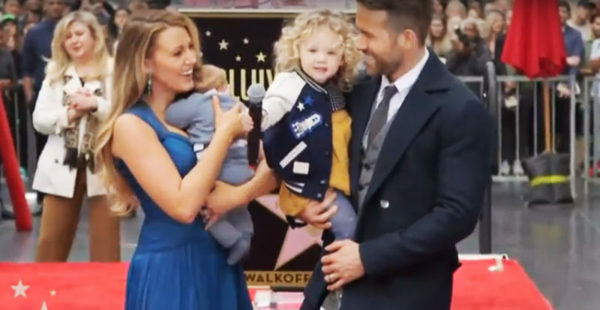 The notoriously private couple have kept their two children far from the spotlight up until now, so this surprise family appearance at the Hollywood Walk of Fame took (delighted) fans by surprise. Blake and Ryan met on the set of Green Lantern in 2010 and were married in 2012. The couple have two daughters – toddler James was born in December 2014 and their youngest little girl (whose name is not known, yet) made her appearance in September 2016. Ryan’s Hollywood Walk of Fame ceremony took place yesterday, and it seems the couple decided it would be a fun event for the kids to be part of. Waiting photographers could not believe their luck, shrieking orders at the family and deafening passersby with a chorus of shutters snapping. The Deadpool star was un-phased, waxing lyrical about his wife during his acceptance speech, US Weekly reports as his family and friends watched on. “You are the best thing, the best thing that has ever happened to me — second only to this star!” He quipped. As the ceremony played out, 2-year-old James played on the red carpet, admired her dad’s star and stole his microphone, taking it into the audience for a bit of toddler vox-popping. “You’ve given me two of the most incredible children I’ve ever hoped to have,” Ryan told Blake, according to US Weekly. Head to the 35 minute mark in the ceremony footage below to see this cute family acting like most other cute families (except that they are superstars and very rich and famous). The bits where James runs away, refuses to stand still for photos, hides from her parents and has a little bit of a tantrum, in the face of a throng of demanding photographers, are particularly relatable. It must be super-hard parenting (and kid-ing) under so many watchful eyes, so we are not at all surprised they’ve kept their kids under wraps until now. Still, it’s an unexpected treat to see this sweet family doing their Reynolds-Lively thing. Congratulations to Ryan on his Walk of Fame immortalisation!